Contemporary art is often what occupies spaces after commerce has departed, or is yet to arrive. 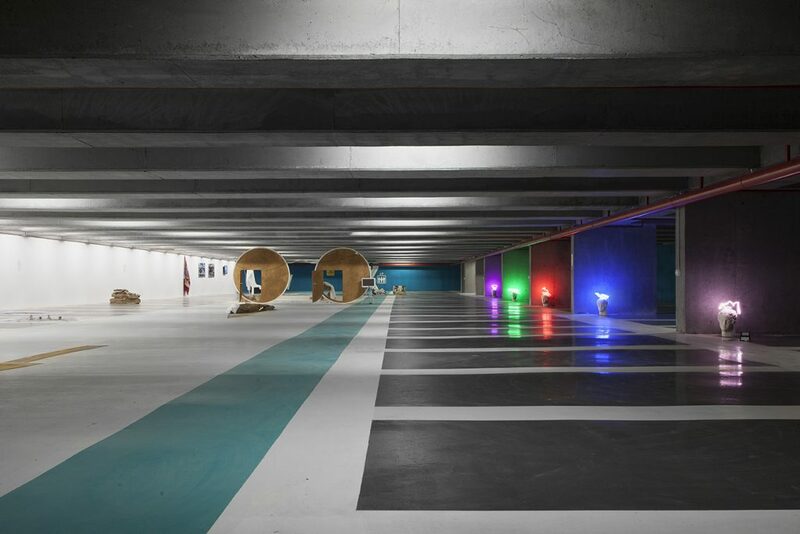 The Moving Museum’s Istanbul exhibition found temporary residence in Şişhane Otopark, a soon-to-be-open underground multi-storey carpark. Its street-level carapace, Şişhane Park, incorporates ‘sunset decks’ east-facing across the Bosporous and an outdoor ‘theatric room’. The park’s still incomplete mezzanine level served as The Moving Museum’s headquarters: a cold, dusty concrete chamber, retail space in potentiâ. Transitional spaces of arrival and departure are The Moving Museum’s choice scenes. An expressly nomadic organization, last year, in London, it occupied a vacant office block on the Strand, and before that, in Dubai, an unopened mall. Besides three works on the mezzanine, two of which, public facing, explicitly addressed aspects of Istanbul’s ecology and political history – İz Öztat’s ongoing research project on water privatization (Sculpture for Rainwater Harvest, 2014) and Aslı Çavuşoğlu’s monument to the first Turkish woman executed by capital punishment (Woman With a Hat, 2014), the majority of artworks were parked across two floors in bays and stud wall booths constructed around extant floor markings and architecture. Rather than adopt an overbearing curatorial principle, The Moving Museum decided to regard each artist’s work as an individual presentation, seeking heterogeneity and contradiction, and foregrounding individual approaches. What unites the works is their production in conversation with Istanbul: some, of course, were more conversant than others. London-based artist Hannah Perry’s diaristic multi-screen video installation, One Park Memory, One Park Imagination (2014), sprawling between two floors on a ramp, exemplified a general tendency of the art on show to foreground subjective experience – of being in and out of place, local and global (‘glocal’), and a nebulous sense of otherness. Haig Aivazian, a Lebanese artist, writer and curator, draws on his Arabic identity to reveal history’s blindspots. Prior to visiting Istanbul, Aivazian’s research led him to the post-Ottoman-era oud player Udi Hrant Kenkulian (1901–78). Once in Istanbul, he collaborated with a local musicologist and craftsman he produced Hastayım Yaşıyorum (I am sick, but I am alive, 2014), an elegant, closed canoe-like form constructed from oud materials, mahogany and tulipwood, which was elevated between two simple wooden stools like an enlarged, sculptural resonator. At times, the preponderance of post-internet work meant the wall texts read like Queneauian permutational exercises in ways of saying that the works were ‘concerned with actualizing the virtual’ and ‘the global network economy’. In Ben Schumacher’s mixed media installation, Picture of Intimacy Cable (2014), sinuous lengths of cable (originally intended to be from discontinued Black Sea telegraph wires) spanned piled islands of grain and furniture – a proxy for the communication networks that, for over a century, have collapsed space and granted intimacy across distances. Yet, as Jeremy Bailey’s project The You Museum (2014) makes clear, today this intimacy is more likely than ever to be compromised, shared with third parties. In the guise of a trade booth, the installation promoted The You Museum, a service that occupies web advertising space with personalized art exhibitions. The service begins following an initial visit to theyoumuseum.org and only ceases if all cookies and data are wiped from your browser security settings. Many of Bailey’s promotional images were shot in Gezi Park – a symbol of democracy following the demonstrations that took place there in 2013 and last year, when protests against the park’s planned redevelopment as a mall progressed into widespread agitation against media censorship, the limitation of the right to public assembly, and the authoritarianism and suspected corruption of the Turkish President, Recep Tayyip Edoğan. During protests, both YouTube and twitter were temporarily suspended. In light of such demonstrations of social media’s power, Zach Blas’s post-utopian declarations of withdrawal from ‘the internet regime’ in Contra-Internet: User’s Agreement (2014) seems a distinctly privileged concern. At Şişhane Park the appearance of the network as a theme signifies a questionable self-reflexivity: if the global network is what has replaced local context then it’s an apt curatorial subject for an organization defined by its nomadic structure. However you say it, the actualization of the virtual in the gallery cannot but underline the specificity of the place in which it sits. Among other things it is a reminder of the privilege of mobility.